jigs or twitch plugs have collectively hit the 20 inch mark in that many streams as well - although I stand by myself in one river and have been bested in another, making the spread of streams that have produced big fish just a little wider than four. Trout have made up the majority of my pursuit, but I've also connected with some nice northern pike in one river and some walleye on a couple streams. All that's really lacking in my river pursuits so far this spring by my usual standards is a good smallmouth trip. Travel for work resulted in seeing new water, directly resulted in one of my 20-inchers, and indirectly resulted in one of my best browns of the year when making a subsequent return trip. A hefty 22 incher caught in a sudden thunderstorm. 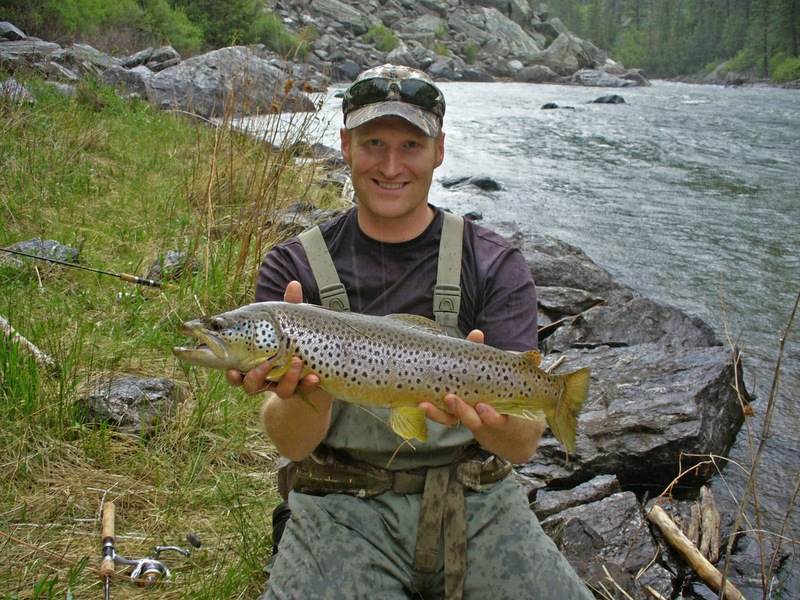 One of the keys this spring, like most any other spring in the West, has been finding fishable water. I played the weather right and hit a fabulous stretch of time in April when the weather was warming but stream flows were still at winter lows for just a couple days before discharge skyrocketed. I also leaned on tailwaters once the melt began to blow the freestone streams out, many of which remain unfishable. I've hit three primary tailwater streams so far (four if you count multiple dams on the same river), none of which have yet been the Bighorn. Two rivers involved weekend or longer camping trips. One involved building a pickup rack to carry my jon boat and be able to tow the camper at the same time, which resulted in a couple days of floating productive water, holding and drifting under electric power rather than oars. Another river was fished just for the day, but involved 200 miles of one-way driving before and after. Left before dawn and got back after midnight. Such was the search for clear water. But each paid off big time in the scenery taken in, the family fun of camping, hanging out with friends, and the big fish that were encountered. So far this spring I have fly fished very little. The focus of each of these trips has been probing the high water with jigs and using plugs as appropriate. I have fond memories of my dad sitting in his bass boat when I was a kid holding up some gargantuan lure on the end of his line that he had just tied on and predictably saying "only big fish need apply!" before tossing the offering out to whatever structure had prompted the switch. Jig and plug fishing is much the same - skip the fluff and go right to the big boys. And higher flows of spring beg for it. As I write this, flows are still mostly peaked, but the corner is turning, and already the hatches are thickening and trout are looking skyward. The surface feeding is picking up, wolf packs are forming on the Missouri, and my fingers are starting to itch for some fly line. Growing up a bass fisherman, there's nothing finer than the "toilet bowl flush" of a fish taking a surface bait. Trout tend to be a bit more dainty, but there's a piggishness in a hefty slurp that you can't deny. Bring on hopper season! 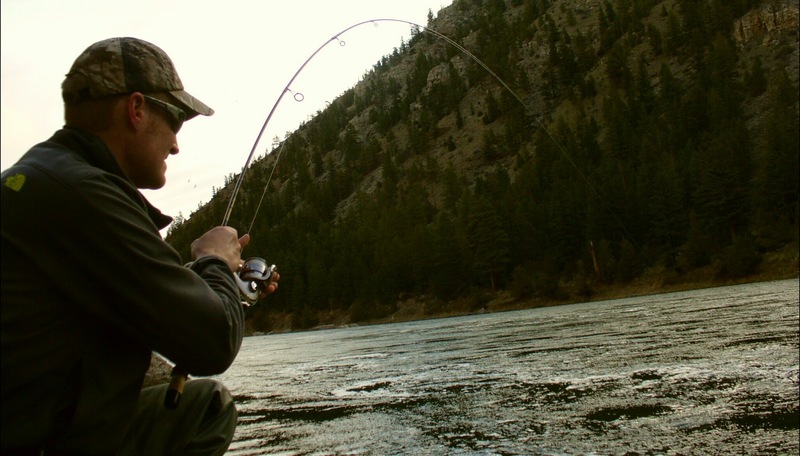 I didn't always hit the weather right this spring - one wintertime trip found me in northern Montana on the water's edge in 6 degrees casting into a stiff wind. At least I can say I tried.... Another water on my list from that same trip was completely unfishable due to being frozen solid, except for where it plunged through the air and then disappeared under the shelf of ice covering the next pool. But another trip that started in the low teens turned out to be a day of bruiser trout. And other days went from sunburns to snow squalls. Spring is great - your wading boots might freeze to the rocks if you stand still too long, but you might also find yourself in a tee shirt soaking in the first warmth of the year. didn't race yet, and I watched the fish take the lure, thrash it like a lion with a gazelle, and then turn to mosey back where it had come from. Mechanically I went to set the hook at just the right position in his turn, but my fingers had failed to take in the slack I'd given the fish to "make his kill". The mistake meant that the hookset was made on a slack line and when the line came tight on the fish the break was instant. The brown started doing somersaults trying to toss the lure. Even before I accepted that I had broken the line, I was watching the fish fight as if he were still attached and briefly tried to convince myself there might just be more slack to gain.